It is the mid-19th century and at his family home in England, Merrick Tremayne is attempting to get his life back together. Wounded while employed as an opium smuggler for the East India Company, Merrick is now impoverished and living at his family home in England, barely tolerated by his older brother who would relish his absence. So Merrick languishes at home, taking refuge in the family greenhouse where a statue his father brought from Peru seems to wander about when no one’s looking. Merrick wonders if he’s going as mad as his mother, who claims to have seen the same thing. Leaving Clem’s wife Minna in Arequipa, the two venture into a world only Merrick has some knowledge of, through his father’s stories, and the fact that his grandfather once attempted to bring out some plants, but even that scant information doesn’t prepare them for what they find. The trees they seek are in forbidden territory. Several expeditions preceded them and didn’t come back but the danger of being killed isn’t as unnerving as other factors—statues called markayuq, supposedly preserved saints who wander the countryside, protecting it and those who pray to them . . . the town of New Bethlehem, now called Bedlam, made up of cripples discarded by their families . . . and a priest who’s both young and old. Father Raphael seems to know why they’ve come and their fates, as well as too much about Merrick and his family for comfort. And there’s a salt line marking where foreigners must not cross, on the other side of which grow the cinchona trees. Clem, brash and out-spoken, more of a mundane mindset than Merrick, isn’t as affected by their surroundings. As he wants to press on, to breach the boundaries and complete their mission, Merrick becomes caught up in the hazy, magic-laden atmosphere of jungles whose pollen lights the air with a mystical glow, and the spell Raphael himself casts. It is as Merrick realizes he and Clem weren’t merely sent to Bedlam to retrieve the trees containing the precious quinine but for a more nefarious purpose that he understands how his life and the lives of Tremaynes coming before him to this part of the world are entwined with Bedlam’s past as well as its future. From the moment Merrick thinks the statue in his garden actually moves, this story weaves a spell around the reader. Having real-life explorer Sir Clements Markham participating in the adventure as well as making the actual Tremayne residence the fictional Merrick’s home gives the story that authentic air which may send the reader looking for more information to verify the facts herein. The exploits of the East India Company and the events in Peru may be accurate to the point where Merrick and Clem enter Bedlam, but from there on, everything has the air of a drug-laden fantasy. The ending is more a beginning than a finish, for both Merrick and the mystically ephemeral Raphael. Author Pulley has penned a haunting narrative with enough basis in fact to raise the belief in its actual occurrence. 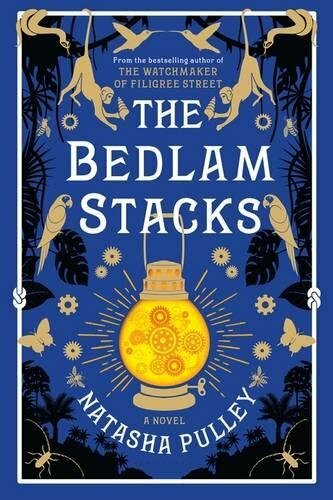 The Bedlam Stacks is an adventure, perhaps a fable, but definitely an intriguing flight of historical fantasy.